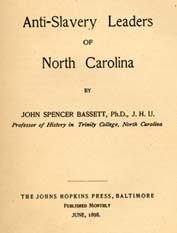 John Spencer Bassett, 1867-1928 Anti-slavery Leaders of North Carolina. Baltimore: The Johns Hopkins Press, 1898. Antislavery movements -- North Carolina. Caruthers, E. W. (Eli Washington), 1793-1865. Goodloe, Daniel R. (Daniel Reaves), 1814-1902.